You would think that the end result of why the anti-seat-recline device ‘The Knee Defender’ has been in the news lately would discourage travelers from purchasing the gadget. After all, a dispute over the contraption caused such an argument last week that a pilot felt it necessary to make an emergency landing of a commercial airliner. Discouragement? It’s been just the opposite. CNN Money has reported that the inventor of the Knee Defender said he’s seen “500 times” the normal amount of traffic on his website for the $21.95 device, prompting him to place a new order with the factory in China. Though Ira Goldman would not give an exact figure on increased sales, he said he’s been overwhelmed by the amount of traffic to gadgetduck.com. The interest in the Knee Defender stemmed from an incident last week. Two passengers in a dispute over a reclining seat caused enough of a ruckus that a United Airlines flight from Newark to Denver was forced to land in Chicago. The two passengers were removed, and the flight continued on to Denver where it landed 98 minutes late. The argument began when a man seated in Row 12 of the plane attached the Knee Defender to his tray table, lowered it, and began working on his laptop. A woman seated directly in front of him turned around and asked him to remove the device so she could recline. The pilot made the decision to land in Chicago, but it was no laughing matter. 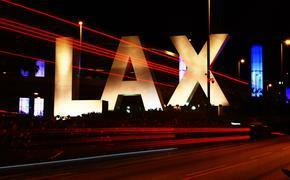 The two passengers face a $25,000 fine for interfering with a commercial airliner. Goldman, who invented the Knee Defender in 2003 to accommodate his 6-foot-3 frame said he tells his customers to respect the wishes of the flight attendants and the airline. 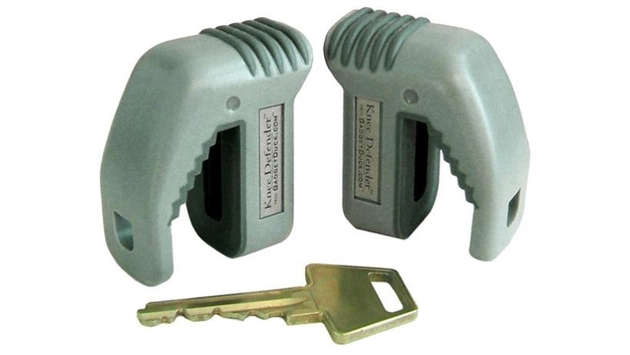 The Knee Defender is banned by most major U.S. airlines but not by the Federal Aviation Administration.